What are the signs of a tornado ? 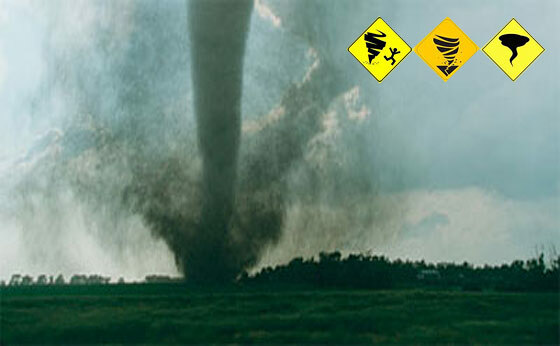 How do you know when a tornado is forming or approaching? 1. The Cloud Base is actually rotating (EVEN IF SLOWLY). Look at the bottom of the cloud base which normally would just be gliding along. This is one of the signs of a tornado forming. 2. A Wall Cloud, a large lowering cloud formation. Look for a lowering of the storm cloud base to what is called a wall cloud. This is a potential tornado sign. 3. Whirling dust debris above the ground (similar to a ‘dust devil’ but bigger). If you notice this beneath a large storm cloud base, it may be a tornado sign that one may have already formed but is still up in the cloud. 4. Heavy rain and hail suddenly stops and it becomes eerily quiet. This may be a sign of an impending rain-wrapped tornado. 5. An intense wind shift after the dead-calm. This is a further sign. 6. If the sky becomes a greenish black color it may be a tornado sign. 7. Hail (especially large golf ball size or larger). The storm’s updraft creates hail and is located right above the tornado, so very large hail is a sign indicative of a possible tornado. 8. A loud continuous roar, rumble, waterfall sound, or sounds similar to a train or jet (which does not quickly fade out like thunder), may be a sign that a tornado is approaching. 9. Debris falling from the sky may be a sign that a tornado has formed and has scoured objects from the ground – hurling them up to great distances. 10. Signs of a tornado at night: If at night you see bright ground flashes near a thunderstorm (blue-green-white), it may be a sign that a tornado is blowing out power transformers and power lines there. Also, when lightning flashes, you may actually see the tornado. I went through two tornadoes when I lived in eastern Colorado. Both were small. The first was fun to watch. Outside playing with the dog so I see it coming. Hop down into the crawl space. Grab the dog. We had some quality time watching the storm go through the back yard. My back yard was 1/2 mile long. The second was anything but amusing. Happened at night while driving home. I could hear the storm. Had no idea where it was. As there was no shelter until I got home I kept driving. Fortunately, it missed me. The truck did take some hail damage. I live in Northwest Arkansas and the tornados are frequent. The sky does turn an eerie green color. Our phone rings with Tornado warnings to let us know. Last year when we were under one such warning I put the kids into the bathtub in the only inner room we have and I went out onto the porch to watch the horizon (I am always the lookout because when we are put under a warning it is for the entire county). I had the TV going so I could hear the updates and track of the tornado. According to the radar it was going to just miss us. The sky turned green and we got hail about an inch to inch and a half across. Then all got calm. I went out into the yard to pick up a hail stone to show the kids and I watched a tornado about a mile north of our house tracking west to east. I have seen many others all with the same signs and yes they sound like a train is barreling toward your house. Good Job Ken you nailed all the signs…..
We see them yearly and have had minor damage. The weather report is key. You will have 24 hr notice if the weather may be conducive to their activity. Then plan to pay very close attention to the sky. We make a party out of it and get together to watch the sky. Being aware is the key and having a exit plan in place. I live in New Haven Ct and years ago we had one hit in the Hamden area. My Dad who was still alive said when the sky turned green one was going to hit. We all thought he was crazy. Sure enough and friends of ours lost their house. You just never know. It is as unpredictable as we women. Nailed all of the signs good job! During the May 1985 tornado outbreak, we experienced all those signs except the “tornado” never touched down. The debris we found had some papers from Mercer (town to the west-northwest of our location. What would that be called? Don’t think it was ever reported and doesn’t appear anywhere in articles about that event except where I have mentioned it in comments. Got off work about 11:15pm and went across the road to get a bite to eat before heading home. Just after midnight, left the diner, went to the parking lot and it was eerily still. Then, there were flashes of lightning and even at night you could see how fluorescent green the sky was (the whole sky!). Went across the street to the hotel where I worked, turned on the TV and two minutes later we got the warning about the approaching tornado! I had never seen vertical whipping winds before. Concrete furniture flying through the air like styrofoam. As we were in the fire evacuation room making the evacuation announcement to the guests, the tornado roared by pulling the metal door outwards, and I will never forget that pulling “pop” in my ears. Luckily, we were all safe but my apartment was severely damaged. We have had a few near miss tornadoes and I have noticed each time that my dogs behavior becomes very erratic. They come running to me barking with their tails down between their legs. This always happens a short time before I can see/hear the tornado. Their behavior is very different than when a stranger comes driving down the driveway. I suspect the dogs can hear the tornado when I can’t. My cows seem to want to run as a herd the other direction. Over the years I have watched changes in wild animal behavior due to abnormal weather conditions as well. Be well all. I’m in Oregon and while it is not tornado country in the last decade we have had a couple of small localized ones hit that did damage for maybe a couple of blocks. We have had a couple hurricanes with the Columbus Day storm being the biggest. I was in grade school and remember the roof from the junior high lifting off and blowing away. We don’t live in tornado country but we can still see a tornado. Several years ago we went through a micro burst. I was standing in the kitchen and when I looked out the picture window all I saw was a wall of white, nothing else, no trees, nothing but white. We found out the next day that the weather service said it was a micro burst. I had never heard that term before, so I looked it up. It took down lots of trees in our town, big trees over 100 years old. Forgot to mention that there were no tornado warning signs when we got hit. The weather service had issued warnings about severe thunderstorms earlier in the day but there was no mention about the possibility of tornadoes. There’s one more sign to watch for when there might be a tornado. It’s a sudden increase in motors revving, screeching tires, blaring car horns, and the whine of large off-road tires going way too fast on asphalt. It’s the storm chasers that are there to save everyone (except for those that get in their way). Most of them drive too fast for conditions, run stop signs and red lights, pass when they shouldn’t, drive in the wrong lane, and can kill you faster than a tornado. They even kill each other once in a while when meeting up at a crossroad and neither yielding to the other. Many of them have learned how to drive nearly as fast in reverse as they do forward, and don’t have a problem with driving on your yard, field, or pasture to get around fallen debris at any cost to continue the chase. We get some in Tenn. too. I remember in particular being awoke by LOTS of lightning with NO thunder. Got up to check the news an sure enough was on the ground about a mile away. Woke husband at the time, grabbed my purse, blanket and pillow. Went into the middle bathroom. Husband sitting on the floor grumpy. Next day he wasn’t grumpy anymore when he saw the damage. Ken, Thanks for the re-post, good article, good information, and a good reminder. The year was 1971, early spring…March. Night time storm. No storm house. No other shelter, just our new single wide we moved into on Christmas Day with snow flurries. 2:30 am..all in bed asleep… unscheduled train….getting louder, not turning with the track…remained in the air. East end of trailer home moved over 4 ft.and dropped off the blocks, even tho tied down. west end..moved over 8″. …4 in family all awoke about same time with the gusting of the wind, “roaring” and unhurt. Dad later said..I heard 4 pair of feet hit the floor at the same time. Damage 1/2 mile away.. Uncles covered trailer had the cresote power poles holding the roof over his unit, up out of ground 2-3 feet and put it back down in a different hole still attached. peices of formica were thru a peach tree. Out of 15 homes, all but 2 or 3 had some minor damage on their property, things like porch damage, roof damage, lawn furnature from somewhere else thrown….underpinning had to be replaced and our trailer had to be winched back up into place from its twisted position. roof had to be re coated.. Power , propane,water lines went in on the east end and they had enough slack, no breaks on those. No one injured….except me as I stepped out the front door and the one step was 4 ft down.I was not yet 12. My dad was military and my Spouse was military so we moved ALOT. Both were in Army Aviation and we seemed to end up in areas that were prone to storms – hurricanes and/or tornados. Our family has ridden out its share of tornadoes and high winds trying to take our homes apart – it is scary. The most recent was about eights years ago when my Dad was visiting and I was surprised when I was able to talk both him and my spouse into coming down to the basement. The tornado edged around our home on its path, and while we only had one giant old tree come down on our garage, it looked like a war zone outside through our whole town. No one was hurt during the storm or during the clean up, which is amazing too. When you see that greenish hue and feel that pressure, you act fast. For us, our basement is already prepped and is a safety area so it was just getting family members down there, which can be difficult as the men in my family like to “watch” the storms. CD, I remember the tornadoes from OK near Ft. Sill, but even more I remember those nasty giant spiders that creeped me out! DAMedinNY – Yea, I know, right?!! If the tornados don’t get you, the giant spiders will!! – Speaking of the storms near Fort Sill back in the 70’s, I was working the ER at Fort Sill the Tuesday they hit. We staffed our own ambulances and I was one of the first responders to the nursing home that had the roof torn off by Lawton’s one reported tornado. We were in the building securing records and medications when the hail started. We were standing in ankle-deep ice water shouting at each other when a second, NOT officially recorded tornado swept the other two-thirds of the site clear of bricks, glass, and everything down to the concrete pad. Later figured it missed me by about fifteen feet. Have been around many others, but that one was the closest. – Yes, it sounds just like a jet engine when it’s that close. Shouting at each other at about 4 inches was the only way to communicate. Papa Smurf, it is amazing the amount of damage a “not officially recorded” tornado can do. It always looks as bad if not worse. They just had one of those in PA with giant hail that destroyed a lot of property. Our friend’s home has every window cracked through the storm window and into the regular window, roof damaged, and siding, along with a vehicle that is thoroughly trashed. All the landscaping and garden plants beat down to the ground with hail and high winds. Yep, no way to prepare for that other than have a place to hide in until it passes. You were so fortunate to live through that one! I have never experienced a weather related tornado. but we were close in North West Nebraska on a highway 20? years ago when the sky turned green and the rain came down so hard you could not see out the windshield at all. That was scary enough. I have also been rather close up to a fire tornado and that too was scary. Several years back we had a storm system come through the Northwest Mississippi/Memphis TN area that spawned several large tornadoes.I literally watched one start to “form” almost directly overhead as I stood in my driveway. That one took out several large warehouses and did significant damage to an area about 3-5 miles from my home. The sky was more an angry blue than green, but the other signs were there such as winds suddenly changing directions, wind stopping and starting, rain starting and stopping repeatedly as if controlled with a switch. NO hail that I remember though. My cousin who lived in MO at the time experienced tragedy from a tornado system that literally pulled the roof and parts of the ceiling off their home as they were huddled in the center of it. His wife, the mother of his children, was pulled up through the gap, striking her head very hard on some of the framing. She was found dead from her injuries. These things are unpredictable in almost every way and can be frighteningly strong. Thanks Ken for putting this one up. Keep an eye on the skies folks, whenever the weather starts getting hinky. Brad, That set or similar set,of storms… tore up the area just south of me along Ms. line…we were gone…and came back to drive thru the twister damage… must have been late 2012 or early 2013.. I read a news article from one of those papers that quote “Top Scientists ” and feature aliens consulting with world leaders. It had an article about a park ranger in Frisco N.C. who was picked up and thrown into some bushes unharmed. That fall I was camping there and 2 Rangers came by to hush us rowdy Scrabble players. I asked if they knew the Ranger that was picked up by the tornado. One said that he was the gentleman. It turned out the story was true, but he did get some bruised ribs and a huge scare. From KS to OH I have seen (and not seen) a few tornadoes. I’ll agree with this list one hundred percent but would like to add how important it is to know the normal weather patterns in your area. In SE KS, it is always windy. When the wind stops blowing, when it gets a little too quiet, that’s where the tornado is. The lesser known wind events are the straight line winds and microbursts, which can be just as destructive as tornadoes, are important to watch out for too but they don’t give as much warning..
Is good to see you post. So don’t be a stranger. Myself haven’t dealt with a tornado, but the straight-line winds, I have. And as you say, not much warning. It didn’t cause us much damage, but areas to my north and west were hit hard. Several months of clean up of downed trees for several areas. I never did find the patio unbrella, my truck topper was a total loss, and the mobile home shook terribly. So I’m told, I’m a heavy sleeper. Slept right through it all. Lived through another undocumented night time tornado at Woodstock, IL. around 1977-1978. Mom was having an operation and my brother and I were staying with our grandparents. Horribly hot and humid that night, our legs and butts were sweating profusely. Remember it was Graduation Weekend in May and we could hear music from several noisy parties late at night from blocks away, the wind was so freakishly calm. Storm hit at 2:30 a.m. and caused huge oak trees to touch all the way to ground. Spent rest of the night in their windowless bathroom, Grandma having lived through four bad tornadoes in Wisconsin as a child and newlywed. Remember the farmhouse of a church friend of my grandma’s had severe damage to second story, less than three miles from my grandparents when expecting the damage the following day. I realize now it was a F3 tornado and no microburst. Lived through three severe ones at Crystal Lake in the 1980’s and one hit each of my cousins high school graduation parties. I have noticed that if the birds and insects suddenly making noise and a storm is coming, you have about fives before a tornado or violent windstorm hits. Anybody else notice that, too?